Our trumpet & trombone students generally start around age 9, due to the physical and mental development necessary for students to experience early success on these instruments. Before the age of 9, we recommend that students take our group “Preschool Music Program” with us. In these settings, young students will develop and enhance the skills necessary to start private instruction. Lessons focus on a foundation of good technique, tone, and musicianship; and lessons can incorporate repertoire from a variety of musical styles including classical, jazz and pop. Our trumpet & trombone instructors are also seasoned performers who bring their experience into lessons to help students improve their stage presence and gain confidence in their performances. We pride ourselves in our ability to match each student with a teacher of appropriate age, interests, and abilities. Having a good student-teacher match allows for optimal learning conditions in a fun, comfortable environment. Many of our teachers actively perform in the Capital District and have original music that can be found on iTunes. At CM School of Fine Arts, we believe in setting a good example, so we strive to connect students with teachers that will inspire them and motivate them to always be their best. 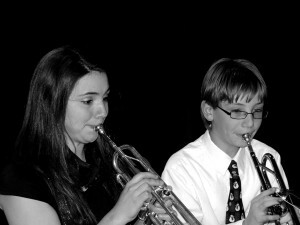 Trumpet & trombone lessons are provided as 30 minute, 45 minute, or full hour sessions. Lesson duration varies depending upon the student’s age, ability, and the amount of material they are capable of practicing every week. For advanced students, longer sessions are necessary. We offer many opportunities for students to perform in outside competitions and music festivals in addition to our regular in-house recitals. Note: All fees must be paid by pre-authorized debit at time of registration. All tuition payments are made by and accepted by pre-authorized debit from bank or checking account only. Credit cards and cash are not accepted for individual in-person payments for lessons each month.